3 Most Creepiest Songs Ever Made – Apparently in this world still keep a lot of mystery, from science, social, even to art. Includes some of the songs below which also keep the mystery behind the lyrics. This time we will discuss about the creepiest songs ever made. Number 1 in creepiest songs ever is Reverse, the song from Karlmayer is a symphony that can make people who hear it exposed to mental disorders, can even be crazy. Some say that the symphony is a demonic music. The song was created by the German poet “Karlmayer.” He created the song to interrogate prisoners of war in European countries. The trick is with the prisoner placed in a dark room and played by Karlmayer’s song for two hours, the effect of the prisoners became weak, depressed and finally willing to confess. Reportedly there are some impacts that can be generated when hearing a song from Karlmeyer. Migraine effect when hearing this song can’t be avoided because there’s a buzzing, shrill and followed by noise. If you hear this song repeatedly, then even if you don’t play this song, your mind will automatically rotate by itself in your mind. You will see sideways, backward like someone is watching you. This is the most severe effect, if you can’t listen to Karlmayer song but continue to hear it, automatically you will be depressed and mentally disturbed. My advice, for anyone who wants to listen to this song, please be careful. If you aren’t strong or afraid you should stop it, and not give a negative impact. The song “Gloomy Sunday” is also known as the “Hungarian suicide song.” The song is always associated with hundreds of suicides, including the one who created it. Occupies the 2nd place of most creepiest songs ever. While this may a legend, but a 34-year-old Hungarian man Rezso Seres created the song “Vége a világnak” (the world ends) in 1933, at the end of the First World War. This is the time when depression sweeps the whole earth. This song turned out to be the best hit song of his career. Some say that Seress himself wrote the lyrics about this war and apocalypse, but others say his friend, Javor, left his girlfriend, who inspired the song as a poem. Regardless of what made Seress stress, he wrote the song that would become “Gloomy Sunday”. The melody uses the melancholic Hungarian lyrics made by his friend, the poet Laszlo Javor. The song that once was called ‘Szomorú Vasárnap’ was just an ordinary song, until two years later the song version recorded by Pál Kalmar was linked to a series of suicide cases, and the song was banned. Although Hungary does have a higher suicide rate (about 46 out of every 100,000 people commit suicide each year), it is impossible to confirm the relationship between this song and suicide. But, this commotion has attracted attention. The fame of this song even made the music publisher from America and England come. Billie Holiday recorded the song’s definitive version in 1941. The song banned in the UK and the BBC calls this song “too annoying” in the early 40s. Only the instrumental version of this song is allowed to played on the radio, until finally the UK lifted this ban in 2002. In his native country, Hungary, this song is strictly forbidden because it has caused an increase in the suicide wave in the country. Gloomy Sunday’s own song is gone from circulation and became forgotten, since the war of Adolf hitler in the 1930s, the song was destroyed, and the original version no longer exists, given the many who have been victims of this song. ‘Gloomy Sunday’ again became a conversation in 1984 after Ozzy Osbourne was dragged to court by the parents of a teenager who shot himself while listening to Osbourne ‘Suicide Solution’. A German film, Ein Lied von und Liebe Tod (Gloomy Sunday – A Song of Love and Death) was released in 1999 telling a love triangle story and is a song that sparked several suicide cases. The song was sung by Elvis Costello, Sarah McLachlan and Heather Nova. Billy Mackenzie the singer who recorded the song Gloomy Sunday in 1982 also died suicide near his father’s home. In fact, he said if Gloomy Sunday song played without lyrics (singer’s voice) or just an instrumental course then the listener will fall asleep and experience a nightmare that looks very real. Then what about Rezso Seress? There are several versions of the tragic end of his life. Some say he survived the concentration camp that killed his mother. Others believe he is trying to come to terms with his ex-girlfriend who inspired the melody of this song and found he had committed suicide. Some say that Rezso Seress committed suicide because he realized that after Gloomy Sunday exploded into his first hit in various countries he thought he would never again be able to create such a hit for the second time. So he intends to end his life. Is there any other reason behind his death? Whatever his version, Seress has tried to commit suicide many times, until he was killed in 1968 after jumping from the apartment window in Budapest. That was the end of his life, and sealed the legend’s suicide forever. Dare to listen to this song? 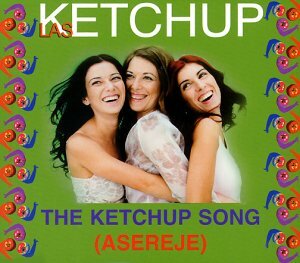 Just listen to yourself ..
Have you ever heard the Asereje song by Las Ketchup a few years ago? Ok, third place occupied by Asereje in most creepiest songs ever made. There are rumors that preach if this song used to worship the devil, from the lyrics mixed between England and Spain mentioned that tucked the lyrics of worship before the devil. But there is one surprising fact, that many Spaniards do not understand the language of this song, because there are many parts that are not Spanish. But strangely this song became a hits in Spain. Even the Spanish national basketball team uses this song as a mascot song. If you are familiar with the lyrics, Asereje’s song tells of someone who is very handsome beautiful and charming hypnotically anyone named Diego. From the former Satanist church’s information it is known that Diego is the ‘code name’ of Devil. Especially for South America and Spain. And you need to know that Lucifer is a beautiful devil and music expert, including dancing. Notice the initial lyrics about a party on Friday night. This is a sacred day for the devil in the west. It is like being the opposite in Indonesia which often means that Thursday night or Friday night is a sacred night of the emergence of demons. Watch the lyrics on the second stanza that tells how Diego can come and disappear at will. It is like describing the figure of Lucifer who can disappear and be present at any time as he pleases to tempt people. In the Assab language in the northwestern part of Africa, the asereje is similar to their dialect in a spirit-summoning ceremony of the person who died by accident. And the rhythm of the spirit-calling ceremony is also similar to the asereje song in the percussion and drum version. That’s 3 Most Creepiest Songs Ever, make this as knowledge only, not to tried. I intentionally did not include sample songs above. Hopefully useful for you. Heya i am for the first time here. I found this board and I find It truly helpful & it helped me out much. I’m hoping to offer something again and aid others like you aided me.